Schneeberger has developed the MINISCALE bearing system which is essentially a high precision miniature guideway combined with an optical measuring system, all in one unit. The range has been developed in order to meet the increasing demand for high speed performance and acceleration duties required by linear motor drives. The unit is based on the tried and tested MINIRAIL linear guide combined with an integrated digital measuring system with an exact scale etched into the rail surface with an optical reading head on the carriage. The encoder provides a digital TTL output with a resolution of typically 1 micron and repeatability to within +/- 2 microns. Rail widths of 7 mm to 42 mm are available and MINISCALE can be used for travel lengths up to 1 metre and speeds of up to 5 m/sec and acceleration to 30g. The combinations of the two functions of the load bearing linear rail and position feedback/measurement in one compact unit offers reduced assembly times and unit cost savings as well as simplified parts ordering and optimised inventory management. 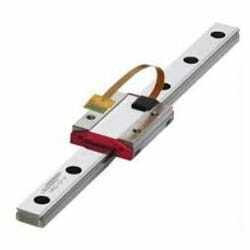 The durable high performance linear motion guides are ideal for application in laboratory automation, biotech and laser machining and nanotechnologies. The exceptionally quiet running and smooth characteristics lend themselves to scanning or high seed incremental moves. The integral measuring/positioning function located close to the load ensures backlash free positioning and hence removes the accumulated “lost motion” errors often associated with rotary encoder systems. If you would like to know more about the Schneeberger range of linear bearings available in the UK, or would like to understand our complete design service, please get in touch.